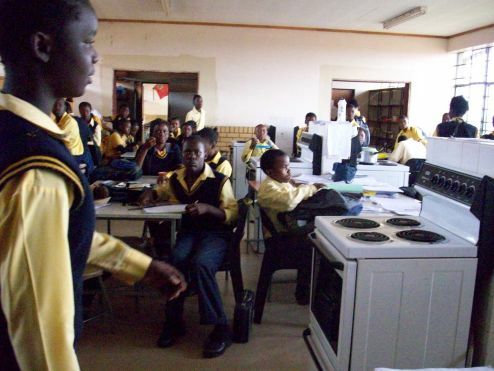 Home Economics room being used for other lessons. 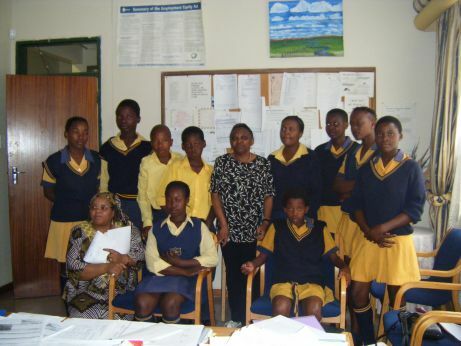 Elaine Daniel and Tania Collins, WFTISA Trustees, joined Mmapula Tladi-Small, on her annual visit to Vosloorus in March 2008. We met with Mmafatsie Pitsie, a teacher, and our original contact in Vosloorus. She visited Waltham Forest on two occasions in the past with groups of South African students for exchanges with the Woodcraft Folk and Ladders Young Performers Group. Vosloorus is a large spread out township built over a dolomite mining area. We visited three secondary schools. 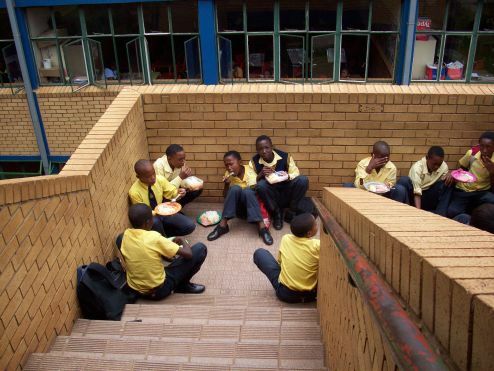 Mmfatsie’s school, Xullu, had fallen down a dolomite hole and the children are currently sharing with a primary school while awaiting completion of their new school. The town library had also fallen down a mining hole, and the children had no access to books or computers. Our second visit was to Ilinge High School. The new Head had done a good job in transforming the school over a short period of time. They had a library and computer room with security doors in place. 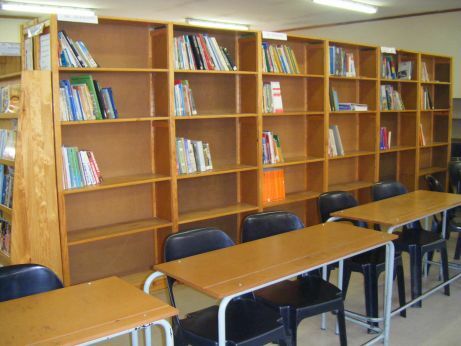 There were very few books in the school library. Finally we paid a visit to Thuto Lusedi, the school we sponsor and met with some of the 30 children we are currently sponsoring. We interviewed some twenty new children to be sponsored by Thuso from this year. 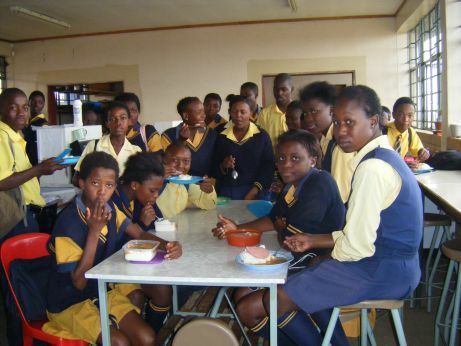 We saw the children having their dinners, provided by our contribution to the school food programme; this consisted of mashed potatoes, beans and spam. Unfortunately, the domestic science room has to double as a technology class room, so the food was dished out in a corridor and children had to stand or sit on the stairs to eat. None of the schools we visited had indoor lunch or exercise space available. The school was overcrowded as all available space is used as classrooms hence no hall for eating the lunch which is prepared on the premises. 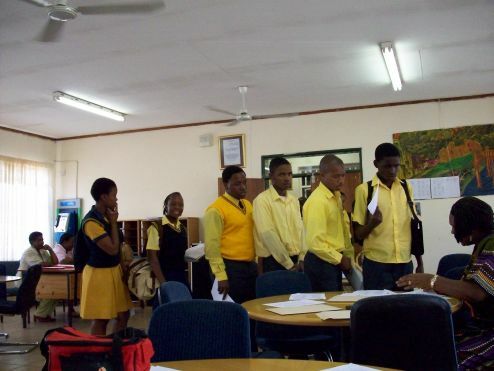 Thuto Lusedi school library was half full of books, all provided by Community Heart – a charity based in Britain which we also support by collecting books from various sources and sorting and boxing them ready for transit to South Africa. Hopefully, we will arrange for the Voloorus schools to have the next container of books from Community Heart. We reunited with Joe, a teacher who came to Waltham Forest on the last exchange, and who told us that most of the children who leave Thuto Lusedi do not get jobs, therefore education is so important. We visited two informal settlements, where the government provides communal water taps and toilets. We now sell beaded jewellery made by members of a Women’s Aids Health Project in the Limpopo region and run voluntarily by retired health workers. They had trained people affected by HIV AIDS in the informal settlements to become Sexual |Health Workers and we were able to meet them. The project’s name is “Azwikundi + Kopano Ke Maatla??? which means “all is possible by strength in unity???. The South African government is working very hard to provide houses for all, but with over two million Zimbabwean refugees, and thousands of legal and illegal immigrants from Mozambique, Nigeria and other African countries the task of rehousing is indeed a very big problem. This year, for the first time, some families are receiving child support grants from the Government which has also started providing transport for those children who live miles from school. There is still such a long way to go!! !